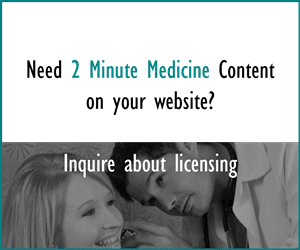 2 Minute Medicine® is an award winning, physician-run, expert medical media company originally founded out of Harvard Medical School and the Massachusetts Institute of Technology.Our content is curated, written and edited by practicing health professionals who have clinical and scientific expertise in their field of reporting. Our editorial management team is comprised of highly-trained MD physicians.Join numerous brands, companies, and hospitals who trust our licensed content. © Copyright 2 Minute Medicine, Inc. All rights reserved.